The colour of Vincent van Gogh's famous Sunflowers is changing over time, because of the mixture of pigments used by the Dutch master in his painting. Evidence for the process now comes from a detailed spectroscopic investigation of the Sunflowers version at the Van Gogh Museum in Amsterdam. A group of scientists headed by Letizia Monico from the Institute of Molecular Science and Technology (CNR-ISTM) of Perugia, the University of Perugia and the University of Antwerp, shone X-rays from DESY's lightsource PETRA III through tiny particles of paint taken from the painting. They describe their results in the journal Angewandte Chemie International Edition. The study also identifies areas of the painting that should be monitored particularly closely for any changes. Vincent van Gogh (1853-1890) is famous for his use of bright yellow colours. The Dutch painter used so-called chrome yellows, a class of compounds consisting of lead, chromium and oxygen. "There are different shades of the pigment, and not all of them are photochemically stable over time," explains Monico. "Lighter chrome yellow has sulphur mixed into it, and is susceptible to chemical degradation when exposed to light, which leads to a darkening of the pigment." Lightfast chrome yellow has the chemical formula PbCrO4, whereas the light-sensitive type has the formula PbCr1-xSxO4, (with x exceeding about 0,4). 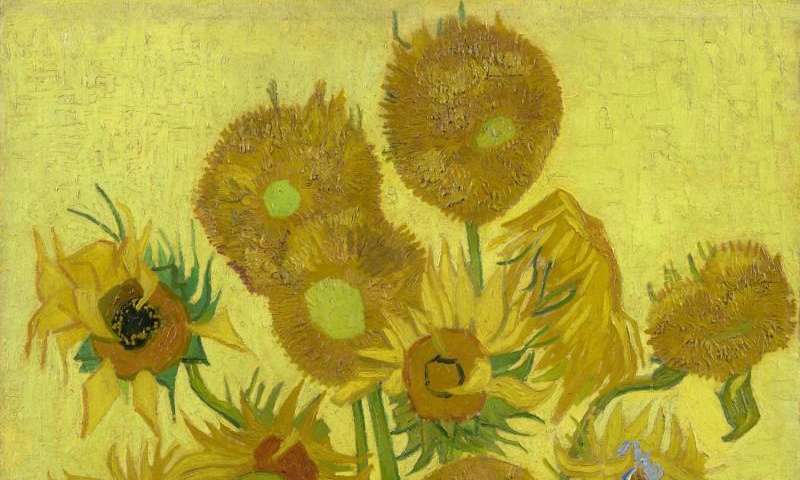 The scientists examined a Sunflowers painting, which dates back to 1889, to determine whether van Gogh had used different types of chrome yellow when painting it. He produced three versions of the painting, one of which is on display at the National Gallery in London, one at the Seji Togo Memorial Sompo Japan Nipponkoa Museum of Art in Tokyo and one at the Van Gogh Museum in Amsterdam. Two small paint samples, measuring less than 1 millimetre each, were taken from the painting in Amsterdam and examined using DESY's X-ray source PETRA III. "The analysis shows that the orange-yellow hues mainly contain the lightfast version of chrome yellow, whereas the light-sensitive type is mainly found in the pale yellow areas," reports co-author Gerald Falkenberg, who is in charge of DESY's beamline P06, where the X-ray diffraction measurements were carried out. At the European Synchrotron Radiation Facility (ESRF) in Grenoble, the team examined the chemical state of the paint samples. 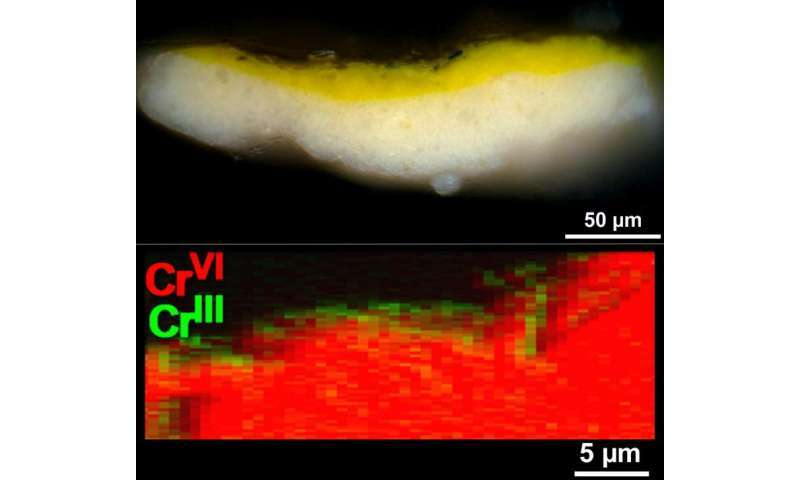 When light sensitive chrome yellow darkens, the chromium is reduced from its highest oxidation state CrVI to CrIII. The scientists were indeed able to detect a relative proportion of 35 per cent CrIII on the surface of the paint. "At least at the two sites from which the paint samples were taken, a colour change has occurred in the Sunflowers as a result of the reduction of chrome yellow," says Monico. This suggests that the Sunflowers may originally have looked different from what we see today. The scientists used a mobile scanner to identify those parts of the painting which ought to be monitored particularly closely for possible changes. "Since chrome yellow pigments were widely used by late 19th-century painters, this study also has broader implications for assessing the colours of other works of art," emphasises co-author Koen Janssens, from the University of Antwerp. Top: Micrograph of a paint sample taken from the table area (lower edge) of the Sunflowers painting. Credit: The Netherlands Cultural Heritage Agency, RCE, Amsterdam. Bottom: At the very surface of the exposed chrome yellow paint, a change of colour has taken place, as CrIII compounds (green) replaced yellow-orange chromates (containing CrVI, red). Credit: Letizia Monico et al. Fading, not wilting. Is there some kind of policy to deliberately mis-state something in every headline? Maybe you've been reading too many of your scammer funded Adblade spam headlines. "Discover the shocking 90-day Alzheimer protocol big pharma doesn't want you to know". Yeah, gen X is coming of age. "Just lie" if it works for you is just good business. Only a "hater" would question that. You got that right. I loathe anyone that would make a living that way. What! Didn't some university researchers claim this was due to Climate Change?